Founded in 1989, UK-based Gee Graphite Ltd specializes in the manufacture and supply of sealing and gasket products based on expanded graphite. Located in Dewsbury, West Yorkshire, and approved to ISO 9001: 2008, the company is very well known in the industry and supplies many of the UK�s leading valve manufacturers and valve repairers. Manufacturing is done in-house, and the company claims the largest range of flexible graphite products in the UK, including graphite seals, gaskets and specialist valve seats. An extensive range of graphite foils are held in stock for immediate processing to satisfy a wide range of applications across many industries. With a history of solving application-based problems from cryogenic to elevated temperatures, and vacuum to high pressures, Gee Graphite continue to supply high quality products based on this unique material. Graphite�s with enhanced resistance to oxidation, corrosion resistance and a grade offering reduced valve stem stiction. Gaskets are available from a wide range of laminates with inserts of Nickel, Stainless Steel, Polyurethane and Tanged Stainless Steel. The product range also includes plain and corrugate graphite tapes, which can be adhesive backed, plus a wide range of die-formed graphite rings for valve gland sealing. Gee also offer range of Kammprofile type gaskets as well as large diameter segmented (abrasive water-jet cut) gaskets and multi-layer metal/graphite seals, fully machined, for valve applications. Gee Graphite also offer an on-site valve un-packing/re-packing service, and have over ten years experience working on UK power stations, chemical and petro-chemical facilities. Gee also offer a bespoke design and supply service for valve and flange live-loading. 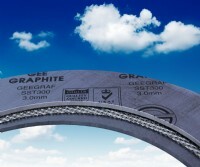 As well as the traditional sealing business, Gee Graphite operates one of UK�s largest Water-Jet Cutting services. This includes eleven water-jet cutting machines, with both abrasive and water-only cutting systems, which can tackle anything from foam rubber to armored steels. Gee also operate a Virtek laser measuring machine which facilitates reverse engineering of certain components. The company also uses sophisticated nesting software for optimum material utilization and cost-control and has the ability to provide 5-Axis machining, tungsten carbide or Stellite coatings of valve seats.